SEATTLE (AP) — A patient at Washington state’s largest psychiatric hospital vaulted over a nurse’s station last weekend, knocked a nurse to the floor, choked her and bit part of her ear off. The assault Sunday night was the latest in a series of attacks on health care workers at Western State Hospital. Hospital spokeswoman Kathy Spears told staff in an email obtained by The Associated Press about the attack. Willie Saw, a nursing supervisor, told AP that part of the nurse’s ear lobe was bitten off by the patient. He said it will need to be re-attached with surgery. The attack by the 29-year-old male patient on the 63-year-old nurse was unprovoked, said Chris Lawler, spokesman for police in the Tacoma suburb of Lakewood, where the 850-bed hospital is located. Lawler did not identify the patient or the nurse, said the patient remained at the hospital and that a police report about the attack was sent to prosecutors for consideration of a charge of felony assault. Saw said it was the patient’s sixth assault on hospital staff since he was moved to the ward six months ago. The hospital has been plagued by problems for years and was repeatedly cited for health and safety violations, ranging from assaults on workers to escapes by violent patients — including a man sent to the hospital after he was found incompetent to stand trial on a murder charge for tying up a woman with electrical cords, stabbing her 24 times and slashing her throat. He was caught two days later, 300 miles (482 kilometers) away in Spokane. In late August, a patient with a history of violence followed a nurse out of a television room and punched her in the face — knocking her to the ground, a police report said. Then he stomped on her head at least eight times, the report said. Tommy Lee Berlin, 19, was charged with assaulting the nurse and with trying to bite the officer who took him into custody. Berlin was sent back to Western State Hospital until his trial. Days after the assault involving Berlin, a different patient walked up to another nurse, hit her in the head and then stomped on her head with his feet, according to a nursing report obtained by AP. The violence prompted rallies by hospital staff who called for changes in the way dangerous patients are handled. Hospital staff said Berlin and other violent patients should be held in secure wards, instead of living among patients who are at the hospital for medical and therapeutic care. Past federal inspections at the hospital have found a lack of qualified staff, worker fear of retaliation from managers and a focus on bureaucracy over staff safety. 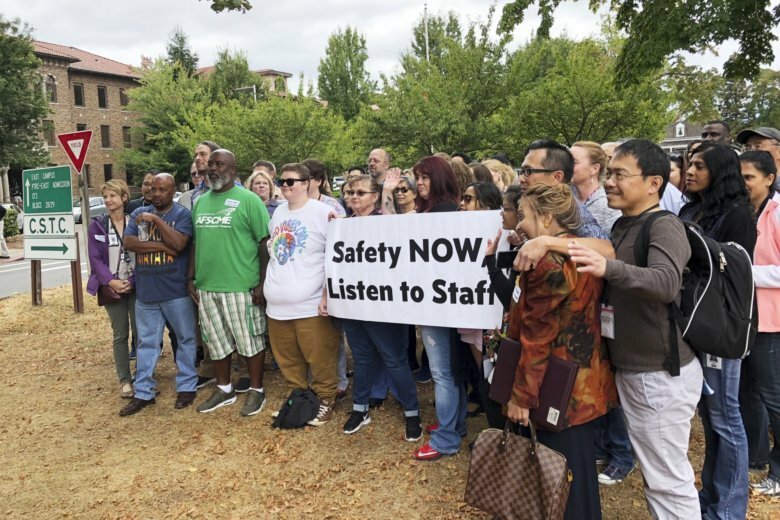 Stowe said the state has been working to reduce violence at Western State and has put in place training programs aimed at improving worker safety.